WXXI's Beth Adams talks to filmmaker Dan Habib. 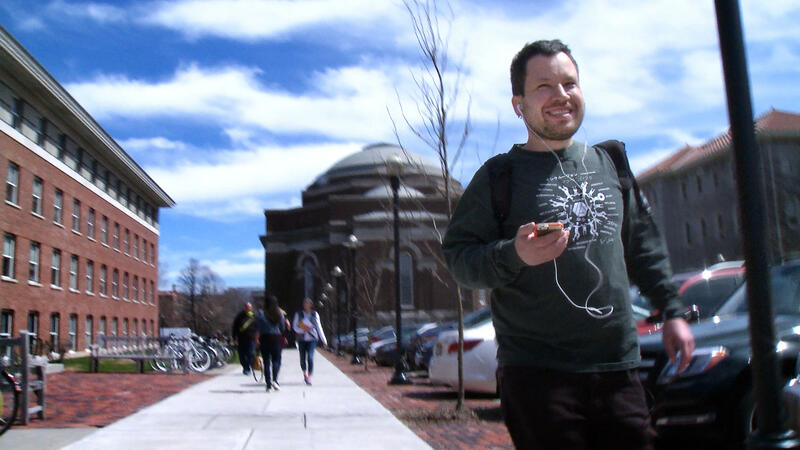 Micah Fialka-Feldman walks to class on the campus of Syracuse University. In Rochester, the graduation rate for students with disabilities is 22 percent* compared to 40 percent nationally. The median individual earnings for those with disabilities is $14,450. This is $4,000 below the national median. That means Rochester’s disabled community is the poorest in the nation when compared to the 75 largest metropolitan areas. Despite the systemic challenges of educational segregation and stereotypes, adults with intellectual disabilities are challenging the perceptions of intelligence as they navigate high school, college, and the workforce. In the documentary Intelligent Lives, filmmaker Dan Habib tells the stories of three pioneering individuals with intellectual disabilities who have found ways to meaningfully contribute to the world. Habib calls them paradigm shifters. 32 year old Micah Fialka-Feldman of Syracuse is one of them. He recently completed his Certificate in Disability Studies at Syracuse University and now has a job co-teaching university classes, a sophisticated grasp of social media – and an IQ of 40. Fialka-Feldman and Habib will be in Rochester for a free screening of the documentary film followed by a discussion on Wednesday, October 3 at the Strong National Museum of Play. Click on the LISTEN link above to hear an interview with Habib. He talks about the opportunities and challenges faced by people with disabilities and how traditional measures of intelligence fall short on many levels and fail to capture a person’s true potential. *Data according to Project Search at the University of Rochester, which provides employment training and education for young adults with significant disabilities.